OAKLAND, Calif. (KGO) -- Some anonymous person made a clever commentary on a chopped down tree in Oakland near Lake Merritt. Someone wrote out a poignant story that's perfectly fitting for the situation. "I don't need very much now,"
"just a quiet place to sit and rest. It's from Shel Silverstein's book "The Giving Tree." If you've never read the story, it's about a tree that's offered years of shade and food. Finally, as just a stump, it feels useless until it the boy needs a place to sit and rest. 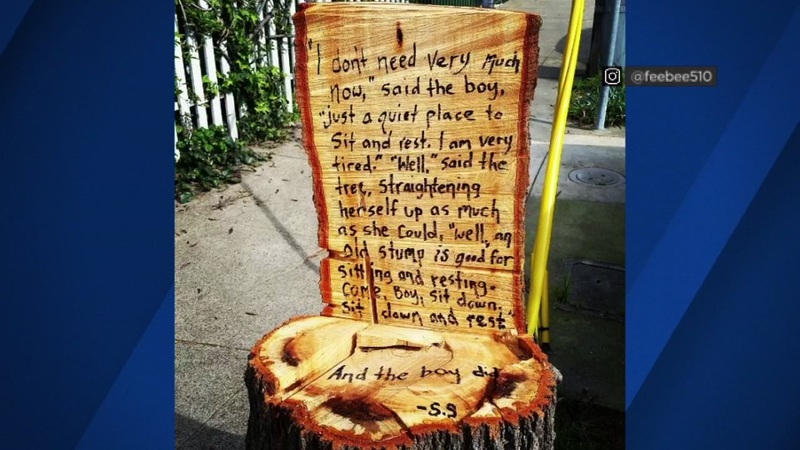 Oakland's "giving stump" has since gone viral.